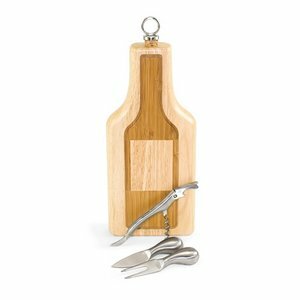 The Wine Bottle Silhouette Cutting Board with Cheese Tools is made of eco-friendly rubberwood, known for its rich grain and durability, with a bamboo inlay featuring the silhouette of wine bottle. The board measures 13in x 4.75in x 2in and swivels open to spotlight 2 brushed stainless steel cheese tools (1 cheese knife, 1 cheese fork) and 1 brushed stainless steel waiter-style corkscrew. The Silhouette also features a ring-style nickel-plated alloy bottle stopper with real cork, which fits into a nook at the top of the board, appearing as though it's corking off the bottle. Your guests will be delighted with the quality and workmanship of this gorgeous conversation piece!